Pulled Pork King Ranch Casserole. The classic casserole famous in Texas gets a little bit of a makeover using tender juicy pulled pork! Layers of crisp tortillas, a chili powder spiked cream sauce with smokey tender pork, and melted cheese. This dish is perfect for get togethers or potlucks! 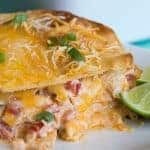 King Ranch Casserole is a classic in the state of Texas. Typically it is made with chicken, but today I am sharing a new version with you! 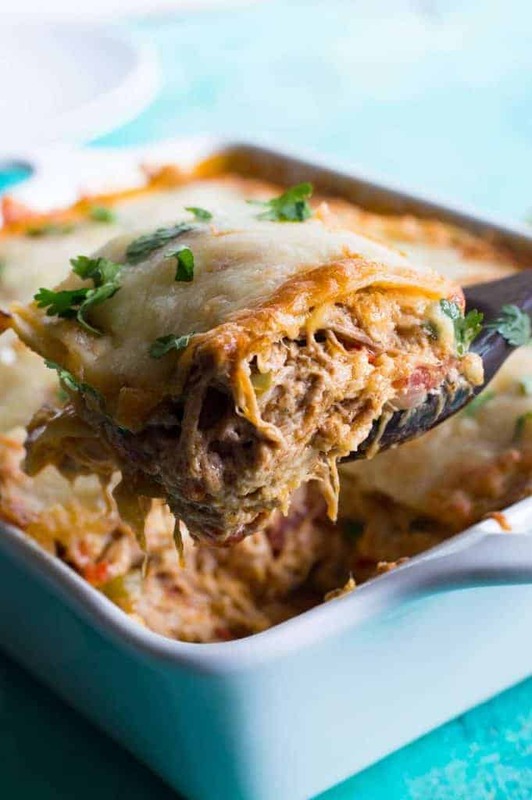 Pulled Pork King Ranch Casserole. It’s basically a mash up of some of my favorite things. 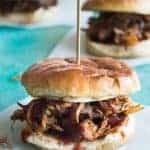 One of my main loves is a good pulled pork sandwich with a drizzle of some classic Texas BBQ sauce. Combine that with my love of King Ranch Casserole and we have a winner. 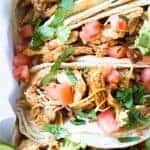 The pulled pork is easy to make in the slow cooker (affiliate link). I made mine the day before and just had it shredded in the refrigerator. If you do this you can either reheat the meat by giving it a trip to the microwave or you can just toss the cold pork into the cream mixture and stir it up. It will cook and heat in the oven, it just takes a bit more to stir it all together since it’s cold. In most recipes for King Ranch Casserole you will see cans of cream of chicken and cream of mushroom being used. I typically will try to find ways around these ingredients. I don’t have anything against them, it’s just a preference I have. I like to make things from scratch if I can and time permits. So for this recipe we’re going with a basic roux. Butter and flour and then a stock. This makes a thick, creamy mixture. And of course we have all of the other goodies in there too, some red onion, bell peppers, garlic, chili powder, cumin. All my favorites. 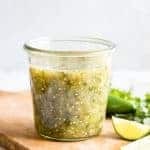 You can add different peppers if you like, a poblano or even a jalapeno. Just make sure you de-seed them, or if you want the heavy hit of heat leave em in! 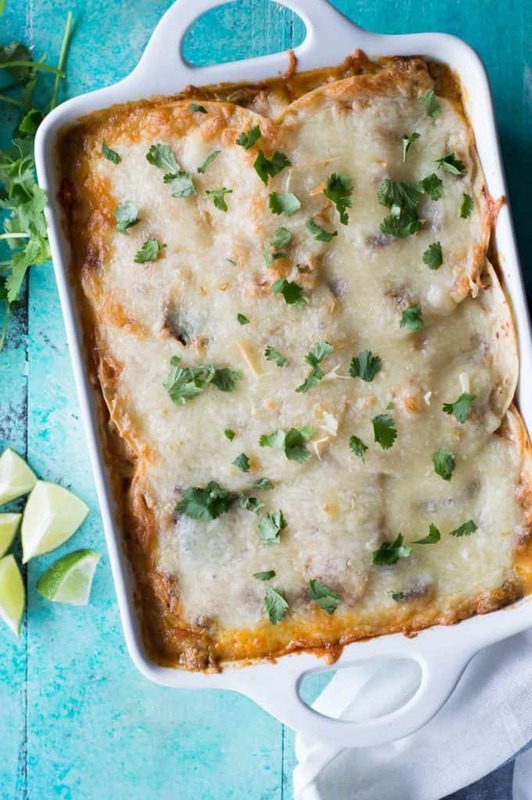 The basis of the King Ranch Casserole is that it’s layered, almost like a lasagna. Except instead of noodles we will use crispy corn tortillas layered with our creamy pulled pork mixture and cheese. Lots of cheese. This casserole is just like all other casseroles, complete comfort food. 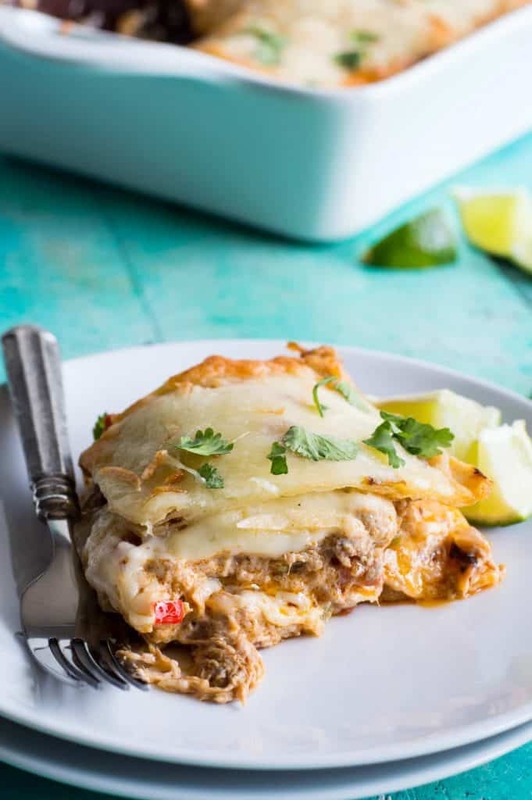 WANT TO TRY THIS PULLED PORK KING RANCH CASSEROLE RECIPE?! PIN IT to your CASSEROLE, or DINNER board TO SAVE FOR LATER! 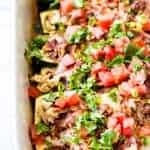 Pulled Pork King Ranch Casserole recipe first appeared on Food Fanatic. I love pulled pork, and this is a crazy good idea of how to use it. This is looking great Serene! pinned! I am pinning this for later. This looks absolutely delicious! 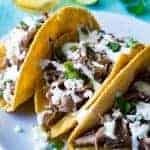 DO you add the pork to the tomatoes/sour cream mixture? I see the recipe states to layer the pork then the sour cream mixture but the directions sound like you combine them therefore having it all mixed together and not two separate ones to layer. Hi Erica, I started with regular corn tortillas that you can buy in the package from the market. Then fried them up myself. Yay! I’m so glad you enjoyed! Excellent use of my left over pulled pork. This dish was amazing. I had a lot of pulled pork left over (which I thought was very over cooked and dry.). 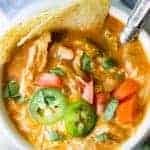 I used yellow onion and a bag frozen southwestern blend of veggies in my freezer in place of the red onion and bell peppers (which includes, bell peppers, onion, corn, black beans) as that was what I had on hand. Otherwise I followed the recipe exactly. Great job! I’ll make it again! Thanks so much! I’m so glad you enjoyed! Want to make this gluten-free for a potluck. How important is the flour? Important enough to sub out g-f flour mixture or can I just omit? Hi Beth! The flour is used to make a roux, which thickens up the sauce in this recipe. To make it gluten free you can use cornstarch instead, but only use half of the amount of flour needed. 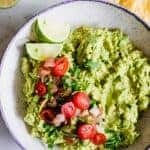 Do you think I could use flour tortillas instead of corn? I would crisp them up before layering. You can use flour. 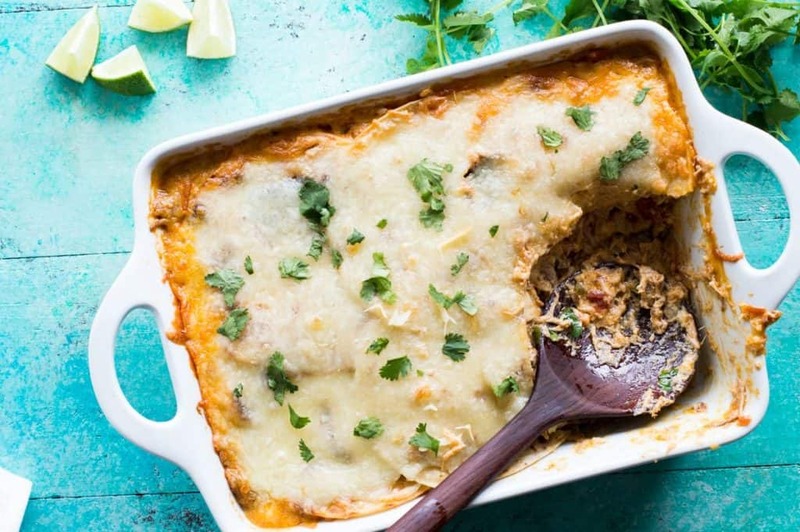 The corn tortillas kind of blend into the casserole. I imagine the flour tortillas would be thicker and maybe give a chewiness. But it would give more solid layers in the casserole. Do the corn tortillas get soggy in leftovers? Or if I make it one day and eat it the next? The next day leftovers will be just fine. The longer it sits though, the tortillas to start to get soggy. My family loved this so the second time I made 2 and froze one. How would you go about heating up the frozen one? Thaw first? Bake time? I’m assuming it’s like lasagne and can be done frozen for an hour with foil and 10 without?